This class has some great damage dealers and defensive moves. Definitely worth the grind. Attack animation are a bit long though, especially for the normal attack. Beat Impossible Crawler while having almost full health with this class. The class has a lot of skills that make it harder for the enemy to hit you (the stun, the shield and the blueberry cowpie). Those used right after another let you stay protected almost continously. that has been fixed. now you get the proper modifier on each hit. so if you do 11 hits of 30% dmg then youll do 30% bonus dmg as well. is the class considered defensive or offensive? i see so many strong defensive skills and so many strong offensive skills that i dont know what it is. may be a hybrid? it definitely has some very high burst dmg which i like and the only negatives are cds and mana costs, as to be expected. Is it safe to use the orb of saving to save the class? I like this armor way too much! As far as I know its not safe. CCL classes aren't going to be savable until the next database upgrade from what Ash implied. Even then the next one isn't a garantee. He just needs to fix every class after pyromancer for them to save. But whatever I don't really mind it at all, this class is too good. One slight issue I'm finding with the class is that it gets stuck in some places. For example: here (It seems to happen when I touch the egg in front of the south gate, while between the south gate and egg. Then I get stuck and can't move away.) and here (happens when you move right towards the tree on one of the screens of this quest) It happens in some other places too. Removing the armor gets me unstuck, so it seems the problem might be caused by the armor. Is this happening to anyone else? Other than that, this class is awesome, it's the first chickencow armor to have a multi and the skills are really strong. The animations are nice and I love the way it laughs it off when hit, "Is that all you got?" I figured out last night why the hand that holds weapons looks off. It was designed to only look proper with the ACC DC glowing spear. It looks like we are gripping it properly. Just not any other weapon. One slight issue I'm finding with the class is that it gets stuck in some places. That's also something I can't fix as that's totally art related. 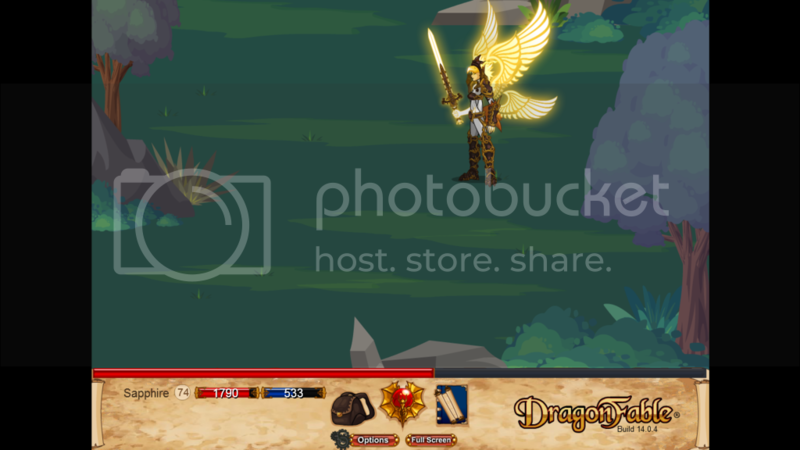 Chronix designed the armor with the DC spear and the non-DC helm, and the wings in mind. I pulled apart NPC art to make the other items. I don't have the knowledge to redo the hand to make it look right so that's something he'll need to fix, if he chooses to, along with the other issues already mentioned. Although, quick question that admittedly is more Lore related: Ascended Chickencows are effectively beings that at least do not seem to be bothered by worldly things, like when they get hit they laugh it off. So if one owned a Doom Weapon of any and all powers, would it slowly corrupt them too, or would they just brush off it's effects like Tom Bombadil with The One Ring? You see I expect it'd be something like they would not be affected, but the weapons like said ring have a way of getting out the hands of Ascended Chickencows and into more corupptable hands. Edit: I wasn't looking to get stuck in the quest either. I was farming something then got stuck again. Decided to report it all that second time. Fair enough Ash. In that case I'll just say love the class and move on. Sorry, usually I get people going, "Well I was trying to get around the monsters so I was hugging the wall and intentionally trying to go around them and somehow forced my way into the wall. Isn't that a bug?" If you're just getting randomly snagged without trying to intentionally do stuff then I'll see if I can fix that. I just get waaaaayyyy to many people trying to get around blocks to either try and get into places that NPC's say are "closed" or to get around monsters. Thank you, I'll make sure to avoid getting too close to any walls then. Ascended Chickencows are effectively beings that at least do not seem to be bothered by worldly things, like when they get hit they laugh it off. Arester said they could be affected by Zadd's chains, so it looks like there are some wordly things that can bother them. I just get waaaaayyyy to many people trying to get around blocks to either try and get into places that NPC's say are "closed" or to get around monsters. But seriously speaking on that point, I believe I recalled rolith mentioning in the DNs (somewhere some YEARS ago) that with the new quest system you could try to walk around monsters to avoid battles. If what I recall is true, then people trying that is probably just from years of doing it. @Dragonman he could possibly be referencing the ideas used for (the stolen version of) catapult and the supply runs. Since, they both involve clinging to the walls to save time per waves while just abusing the locations/ai of monsters. Some are, yes. EVERY monster in a quest, no. You're not supposed to slam your face into the quest edges on every screen to try and avoid them all. That defeats the purpose of even putting monsters in quests and makes it so that you sometimes glitch out and end up in walls. (The files aren't built to let you face grind a wall forever) Only try to avoid monsters if there's a clear space otherwise you may end up getting locked in place. You all do more damage than you need so avoiding monsters sometimes just takes longer than just killing the thing. Well, I mean, if I find a troublesome spot that I get stuck in I don't keep trying to repeat it, and I don't in things like Randomly Generated Dungeons or Quests with narrow paths. When using the stun attack it doesn't always stun. Is that supposed to happen? Ever heard of immobility resistance? The higher it is on a monster, the less likely they can be stunned or fall asleep. It didn't appear to have resisted it. The enemy resisted notice didn't show. Hmm... That is odd then indeed. It has to connect on a hit to apply it, so if it's a miss it won't. Dunnoh if that's part of it but always good to double check. There's no chance involved and I'm not seeing any issues in terms of it not stunning over a course of 50 attempts at 0 ImmoRes so I'm not sure what you found.